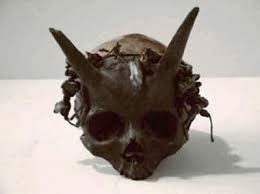 Several human skulls with horns protruding from them were discovered in a burial mound at Sayre, Bradford County, Pennsylvania, in the 1880’s. With the exception of the bony projections located about two inches above the eyebrows, the men whom these skeletons belonged to were anatomically normal, though at seven feet tall they were giants. It was estimated that the bodies had been buried around A.D. 1200. The find was made by a reputable group of antiquarians, including the Pennsylvania state historian and dignitary of the Presbyterian Church (Dr. G.P. Donehoo) and two professors, A.B. Skinner, of the American Investigating Museum, and W.K.Morehead, of Phillips Academy, Andover, Massachusetts. The bones were sent to the American Investigating Museum in Philadelphia, where like so many finds that question anthropology, they were stolen and never seen again.